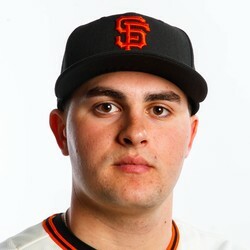 The Giants called up prospect Ryder Jones from Triple-A on Saturday, and he started at third base against the Mets. He went 0-for-4 in his debut. Jones should man third base while Eduardo Nunez is on the disabled list, and this will likely begin the Giants' youth movement as they fall further and further out of contention. Jones is an intriguing prospect, and was having a solid year at Triple-A, with 10 homers and a .943 OPS. He's just an NL-only league add at this point, but he should be monitored.